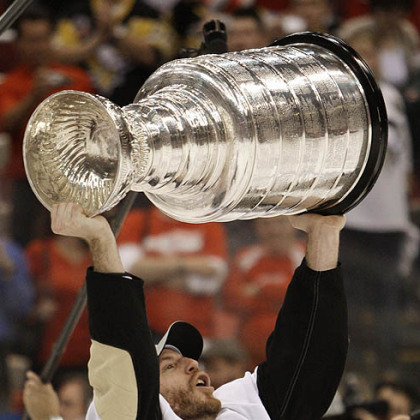 The Penguins have not won a Stanley Cup since 2009. After having some embarrassing exits from the playoffs the last few years, Ray Shero knew he needed to add a piece or two in the offseason to acquire the proper chemistry to win a cup. He not only added a few pieces, but he brought back "the piece" in Rob Scuderi. Rob Scuderi will forever live in Penguins lore for his save in Game 6 of the 2009 Stanley Cup Finals. With less than two minutes left to go in the third period and the Penguins clinging to a 2-1 lead, Scuderi got down on all fours to ensure a loose puck in the crease would not tie the game. This is the most memorable event in Scuderi's career, but it is just a small snapshot of his overall game. He will never bring flashy moments or great offensive production, and that is exactly why the Penguins brought him back. That is because at times the high-octane, quick-scoring Penguins forget about one thing... defense. For example, they were able to beat the Ottawa Senators in last year's playoffs on talent alone, but gave up a great deal of quality scoring chances during the series. Meanwhile, the Senators were hardly an offensive juggernaut finishing 27th in the NHL during the regular season in terms of goals per game. Scuderi started off the season very strong with over nineteen minutes of ice time per game and a +5 in October. He missed much of this season when he suffered a broken ankle on October 26. However, since his return on December 29, he has struggled to return to his early season form. Since December 29, he has been a -8, and in the past four games, he has been on the ice for the most goals given up with seven. While I am sure some of this drop off may be due to the fact Scuderi's partner recently has been Kris Letang and not Matt Niskanen, like it was in the beginning of the year, much of it is on Scuderi. His post-injury game is taking a bit longer to round into form than I expected, but I have no doubt he will be returning to "the piece" on the ice sooner rather than later. “Absolutely not, if you're going to try and play hockey like the Harlem Globetrotters, you're going to get burned. We continue to make the same mistakes, go for the same highlight reel plays. That might look good on the highlight reels every now and then, but it's not a formula for winning." These are incredibly strong words from a player that I have not seen speak up very much. Was this out of frustration from his own play recently? In part, yes it was. I have also seen many folks on social media blasting Scuderi for making these public comments, and while I see their points, the only thing I could do after reading his comments was to sit back and say -- Bravo! If readers and fans sit back for a minute and think about the successful Penguins teams from the recent past, they have always had an outspoken veteran to provide some clarity and focus during the most crucial points in the season. In 2007 and 2008, Gary Roberts was the grizzled veteran, and in 2009 it was Billy Guerin. This is part of what was missing during the previous few seasons. The outspoken leader does not need to be your captain. For all of Sidney Crosby's positive traits, being an in your face leader is not one of them, and that is fine. He leads by example through work ethic, determination, and his play on the ice. So this task defaults to one of the other members of the team, and everyone has been terribly quiet the past few seasons especially in the playoffs. I think Rob Scuderi can be that veteran player for this team during this season. When Ray Shero went out this off season to re-acquire Rob Scuderi, he knew what he was going to get from him on the ice -- a consistent stay-at-home defenseman to help insulate Marc-Andre Fleury, Tomas Vokoun, and/or Jeff Zatkoff. He and Dan Bylsma also knew what they were going to get by hiring Jacques Martin to hone in on team defense and responsibility. For the most part, the Penguins have done a good job this season by only allowing 2.4 goals per game, which is eighth in the NHL. In recent games, however, the Penguins have looked sloppy and given up some two goal leads. It looked eerily reminiscent to some of the games in the postseason the last few years. While some folks may criticize Scuderi for his comments because it was 'only one game', sometimes a public comment is necessary to help refocus the team. By the way, the Penguins held a 2-0 lead to the Flames the very next night and went on to win 2-1. Did his comment the previous evening help at all? It is people like Scuderi who have a job to do not only on the ice, but off of it as well when they feel the Penguins are deviating from their defensive approach. Fans can bash him now, but they will be praising him in May and June because he just may be the piece this team has been missing since 2009.